The Hainan Women’s Federation, the Hainan Provincial Department of Human Resources and Social Security, the Hainan Provincial Trade Union and the People’s Government of Lingshui Li Autonomous County organized a special job fair for migrant workers in Lingshui, south China’s Hainan Province, in March 2013. 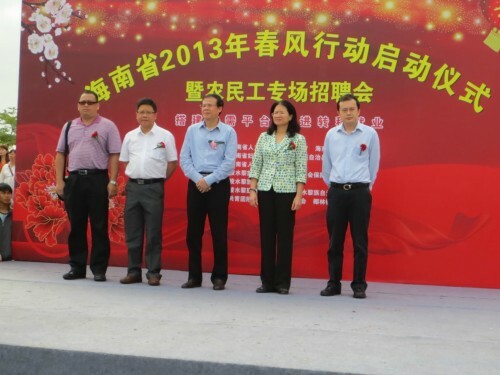 Vice President of Hainan Women’s Federation Fu Caixiang attended the fair. Forty-five companies and three training institutions took part in the job fair, providing more than 2,000 positions. Flyers and recruitment information were distributed to migrant workers, and companies provided them with professional and policy guidance, encouraging them to register for professional training sessions sponsored by the government. The Hainan Women’s Federation attaches great importance to women’s employment and entrepreneurship and has launched many activities to help Hainan women start their own businesses.